Being a medical assistant is a good paying and stable job. What they do is they provide assistance to physicians as well as other medical professionals. But just before you can even become a medical assistant, you also have to finish your degree. Are you planning to pursue this career? There are various universities that offer programs that will equip you with the knowledge and the tools that you need in order to become an effective medical assistant. One of the things that you will have to submit is a letter of recommendation for a medical assistant. This may appear to be just an ordinary letter. But in reality, it actually carries weight in your application in the sense that the selection committee will use information written on the letter of recommendation for medical assistant student in evaluating the applicant. Medical assistant certification: Medical assistants are eligible to work in healthcare facilities, clinics and with physicians. They ensure the proper working of healthcare facilities. They can also perform some specialized tasks as well. To get medical assistant certification, one must complete the medical assisting program, from an accrediting institution. After that, you can take a medical assistant certification exam and work as a certified medical assistant. How much does a medical assistant make? The salary and income of the medical assistant depend on various factors. But an average medical assistant can earn $33,606 in a year. The range is between $30, 000 to 36,000. With the experience and location of the healthcare facility, the salary of the medical assistant varies. What education do medical assistants need? To become a medical assistant, one must complete his graduate. The associate degree in medical assistant is a two years program. It should be accredited by a formal government institution. How Do You Create a Winning Letter of Recommendation? Know what are the specific requirements needed for your medical assistant recommendation letter. Schools may vary in the sense that there are some that have particular templates or guidelines to follow. The recommendation letter medical assistant should be written by someone with credentials. You would definitely want to impress the person reading your letter. It should be perfectly written which means that it should be free from any type of error. Take the time to check not just the grammar and spelling as well as the overall structure of the letter as well. Look at the different sample letter of recommendation for medical assistant. By looking at the samples of recommendation letters for medical assistant, you get to see what a nicely written medical assistant LoR looks versus a poorly written one. If you are having a hard time making your own, it is always best to rely on a professional writing service provider. Letter of recommendation for medical assistant as well as a letter of recommendation for professor should be arranged from the right professional in order to generate more reliability on the applicant successfully. Importantly, this letter should carry suitable and sufficient recommendations in the candidature along with suitable evidence in it too. It is not a tough task through checking our entire medical assistant letter of recommendation samples online. This medical assistant references sample will teach you more about the required quality rich letter of recommendation medical assistant to a good extent. All our samples are open to all and the below-mentioned sample is the best example in this context too. It is definitely an absolute pleasure to write this recommendation letter for one of my best students that is Felix. He studied in my college for 3 years and he was a brilliant student in the class too. It is very common for a teacher to have attention and interest towards the students who perform well and Felix is one such for me in my college. Felix is always a good student in the college and his acquired A grade with exams always is the best proof in this context too. He is not alone the best student and the best individual that made himself available for every volunteer work in the college too. He attended many volunteer programs in the college those we conduct for local hospitals. Academic knowledge and this volunteering exposure made him a better science student always in the college. Felix wrote a paper on the topic strengthening of the USA Primary Care and that was a brilliant effort from him as a student too. Now, I want to recommend him for your medical assistant position and he is equipped well with all the needed qualities and qualifications to discharge perfect duties in the position too. Definitely, this given chance can prove as the best asset for your organization as I always believe in his caliber. He will contribute well for the position by using his knowledge and experiences to the full extent. I recommend strongly Felix for this medical assistant position in your Family Healthcare Specialist Unit and I am sure that he is a very competent individual for that requirement. I am providing my c contact details below and you’re free to contact me for any further feedback or information on Felix and I will be happy to be of suitable help. 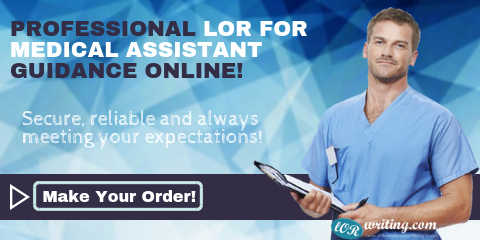 Check our above letter of recommendation medical assistant example or find LoR residency sample on our website and use them as a reference for your letter writing needs too. Writing a 100% Winning Letter of Recommendation for a Medical Assistant! These days, most of you are not able to display why the university of your dream should select you over your peer, but it’s also a possibility to express and give an explanation for what you have completed, out of doors of your software shape. Writing a medical assistant letter of recommendation may be tough. Whilst you actually want to have a look at something, it shouldn’t be a hassle mentioning reasons why be natural and it’s going to pass smoothly. Explain why you are the maximum suitable candidate to observe the course, be specific, clean, informative and provoking. Now after everything is said and done, we understand that most students will still find it really tough to start writing their letter of recommendation for medical assistant certification. Set aside your worries. 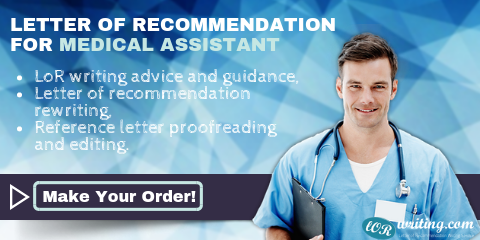 We have a team of the best recommendation letter for medical assistant writers, proofreading experts, and editors who can help you from creating your letter of recommendation for a medical assistant to ensuring that there is no single mistake that can affect your application. If you want to know how to create a powerful letter of recommendation for medical assistant, get our help today!